As a parent, you want to do everything you can to create the right foundation for your child’s oral health throughout life. 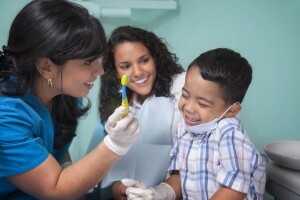 However, many parents remain unsure about the unique requirements children have when it comes to their oral health and oral development. As your Dentist in Williamsville, NY, we want to help you ensure your child develops and maintains a healthy smile. With the right oral care from an early age, you will set the foundation for a lifelong healthy smile. It is never too early to begin teaching your child the importance of oral hygiene. As soon as the first primary tooth erupts, your child needs to have their teeth brushed twice a day using a fluoride toothpaste. As your child ages, teach them to correctly brush each surface of the teeth, paying careful attention to cavity prone areas. In addition to brushing, children need to floss their teeth once a day. Using 18 inches of dental floss, teach your child to carefully insert the floss between each tooth to form a “C” shape around the tooth. The floss is then extended to the gum line and back up to the top of the tooth. This process is repeated for each tooth. Home oral hygiene is only half of the care your child needs for oral health. Your child needs to visit the dentist every six months for preventive checkups and dental cleanings. With regular appointments, we will maintain your child’s oral health while preventing and detecting potential dental problems. Cavities are the top dental problem we treat, with roughly 20 percent of children under the age of 11 having at least one cavity. In addition to brushing, flossing, and visits to the dentist, teach your child the importance of limiting the consumption of sugary and starchy foods and drinks. Sugars and starches cling to the teeth and weaken the enamel, causing cavities to form. Help your child make healthier food choices that will not just prevent cavities, but make the teeth strong and healthy. There are several foods that promote the health of the teeth, such as those that are high in minerals, like calcium and fluoride. Fruits and vegetables are smart choices for a sweet snack that will not damage the teeth while also providing vital nutrients. Starting from the age of 2, your child needs to see the dentist twice a year for semi-annual appointments. In addition to cleaning the teeth and checking the health of the teeth, we are able to detect potential dental problems, such as orthodontic concerns. With early detection and intervention, we will ensure the teeth develop correctly, reducing the need for invasive or lengthy treatments in the future. At Amherst Dental Group, we provide comprehensive care for the entire family—even young children. By making oral care a priority from a young age, you will ensure your child develops a lifetime commitment to their oral health. Contact our office today to schedule an appointment for children’s dentistry.